My week’s expenditure was just about average and according to the pattern of my last three weeks, if you ignore the big chunk of unexpected spending due to an incident… proving that you should have money set aside for emergencies. It also makes a more interesting story for this week’s entry because me moaning about being a budgeting failure is getting old. I did groceries. I went out for meals a few times. I treated myself to a coffee twice. I ate all three meals at home today and only spent RM7 on cut fruit and a cup of coffee. I am done with this NSS week. Some time in the last 14 days, I got out of bed after a morning nap, went out to bring in the laundry, and came back into my bedroom to find that the wardrobe system (above) has collapsed across my bed, along with my hanging wardrobe. It was fortunate that it did not break anything, my face included. While the arrangement was quite stable in its original position, I was not able to get it back up because at least one part was damaged in the fall and another part may have been the reason why it fell over in the first place. After an hour of trying to restore it to its original state, I found that it remained dangerously wobbly. I gave up, dismantled it and moved it to the storeroom. 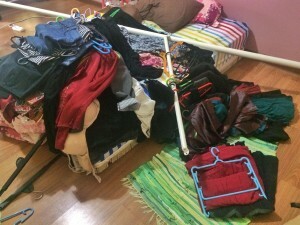 Which left me with a problem of what to do with my clothes. A friend suggested that I bring the laundry rack in, which was a great idea. 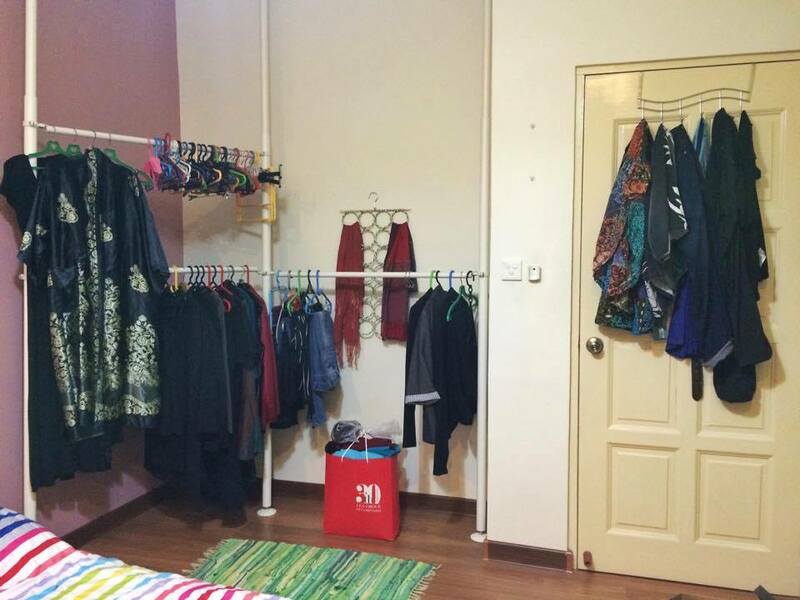 It gave my clothes a home while giving me time to look for an alternative. 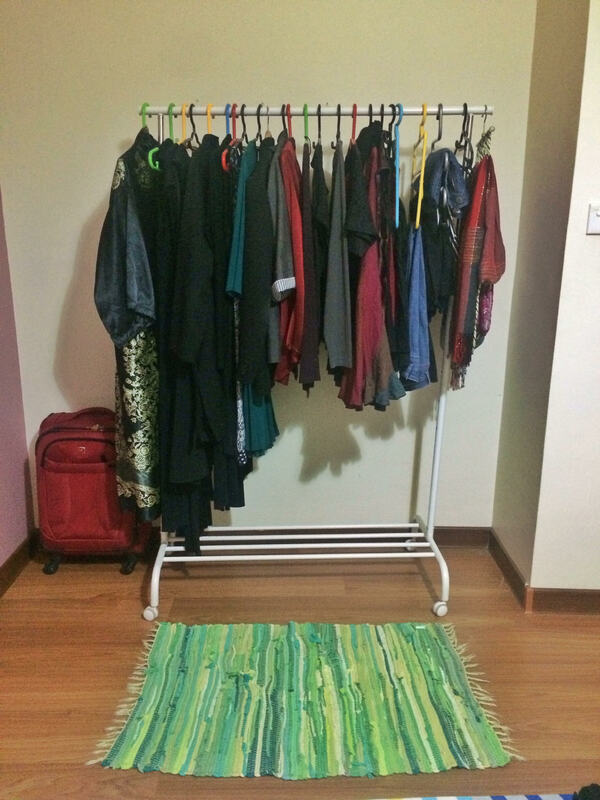 I knew that all I needed was a clothing rack, preferably one with wheels. Luck was on my side. 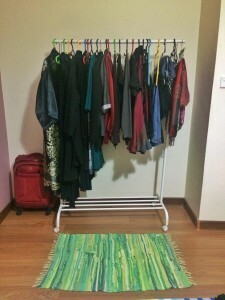 The day I had time to pop by Boulevard to raid their IKEA section, they had two clothing racks available. One had wheels. It cost me RM81.90 but it’s mobile, a long-term investment and completely necessary. It doesn’t look like I have a lot of clothes here but I still feel like I have too much, especially when half of these are special occasion clothes… stuff I only wear a couple of times a year while hoping that people forgot I wore the same thing to the last special occasion. The more frequent wear clothes are in the drawers, and it’s become rather apparent that I’m only wearing half of them although I culled many items earlier this year. I walked by a shop at CityOne the other day and saw that they had the same line of patch quilt pants that I got in KL and love to bits. Was tempted to get another pair because I wear those as often as I wear my jeans, but I decided to postpone that decision until later. Two days left. I’m not planning to immediately go out and buy a boat after this is over, even if October is my birthday month and traditionally I’d treat myself to something major like a holiday. The project continues, and my spending habits warrant some more detailed analysis.